Visit the Land You Buy? Is it good or bad to visit the land? Is it necessary? Visit the Land You Buy? Jack Butala: Visit the Land You Buy? Every Single month we give away a property for free. It’s super simple to qualify. Two simple steps. Leave us your feedback for this podcast on iTunes and number two, get the free ebook at landacademy.com, you don’t even have to read it. Thanks for listening. Jack Butala: Welcome to our show. 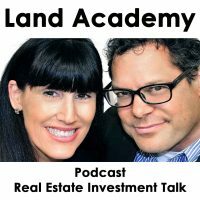 In this episode Jill and I talk about whether or not you really need to visit the land that you buy. Before we get into it Jill, share something funny with us. Jack Butala: It’s called a throne. Jill DeWit: Is that really what it’s called? Jack Butala: It’s a drum set stool. Jill DeWit: Like the bathroom throne? Jack Butala: I wouldn’t bring that up. Jack Butala: In fact, that’s actually never crossed my mind, that comparison. Jack Butala: This show is not about real estate at all. Jill DeWit: No, it’s not. We had to do a temporary studio here is really what’s going on. We walked into another area where there’s a drum set set up in this studio. Instead of moving things around and making the desk and whatever, Jack just decides he’s going to use the drum set to set up recording equipment and use that seat. I just think it’s hilarious. I need a photo of this. Jack Butala: These seats are comfortable as hell, man. I will probably use them in the office or something. Jill DeWit: There you go. Office chairs are out and the drum set thrones are in. Love it. Jack Butala: Let’s take a question from a caller, posted by one of our members on successplant.com, our free online community. Jill DeWit: Yes. Okay, so Matt, who is one of our pro members asks … I love this question. “Does anyone have any experience in buying and selling land in South Dakota? I have a lot of family from there and go there frequently. I’m interested in sending mailers, but when I look at Land Watch, something seems different. Most parcels are up for auction on Land Watch, not for sale. Any advice?” That is interesting. Jack Butala: You know, we’ve made a second career out of auctioning off property, $1 no reserve, so that’s great. Don’t be afraid of auctions. Auctions are awesome. Especially because we’re not in the business of maximizing price. Auctions are great for more cash flow and the whole thing. You know, yeah. We auction property off at least multiple times a month, let’s say. Mostly on eBay. To answer your question about South Dakota, it works everywhere. This program works in all 50 states and Canada, and that’s only because that’s where I know that there’s data. It would work anywhere you have access to assossors data like we have. I just had what we call a deal review call with 2 guys from South Carolina. They were looking at doing this in South Dakota, all over the country for some reason, because they had a lot of success with it in South Carolina. Yes, Matt. Is it $100 an acre in South Dakota, offer price like it is in Nevada? No, but it works. That’s a topic for a different show. Jill DeWit: I like that. Well, and Matt has all the answers, so Matt knows how to do all that, to look for how to price it and all that good stuff. Jill DeWit: Yeah, he’s all in man. Jack Butala: He’s an actual member? Jack Butala: I didn’t know you actually really worked here. Jack Butala: I still didn’t understand your answer. Jack Butala: What do you do for a living, Jill? Jill DeWit: It’s impossible, you know, when it’smfor somebody who’s not in our world, it’s hard for me to describe. I usually kind of just … I try to make it so there’s not going to be a lot of question like, “I handle a lot of real estate data for people who need data,” king of thing. They’re like, “Oh,” and that pretty much stops the line of questioning. Jack Butala: That’s what I want. I want it to stop right there. Jack Butala: Otherwise it’s 2 hours of questions and answers. That’s what we do for a living, I don’t want to do that when we’re not working. Jill DeWit: That’s it. It’s like our baseball friends. The last thing they want to do is go out and talk about baseball. Jack Butala: We have several friends who are professional umpires for the MLB. I have never talked about real estate or baseball with them. Jill DeWit: They talk about cars. Jack Butala: We talk about cars and girls. Jill DeWit: Yeah, exactly. That’s way more fun. If you’re ever in this situation, by the way, use the word data and just make up a job and put data in there, and it’ll stop the questioning. Jill DeWit: Tips from Jack and Jill. Jack Butala: 15 years to get it down to 1 sentence, and it works great. Jill DeWit: It does. Love it. Jack Butala: Today’s topic is, do you need to visit the land that you buy? What do you think Jill? Jill DeWit: Ask me the last time I visited one of our properties. Jack Butala: Have you ever seen a piece of property? Jill DeWit: You know, I was just asked this recently by a new member the other day. I told her, I said, “The last time I saw something, forever …” You know, it’s always a drive by. I don’t think I’ve ever really stood on anything; it’s a drive by. Jack Butala: We took an RV trip to Canyon Lands, to Utah. What was it, Canyon Lands, and what’s the other park up there? Jack Butala: Yeah. We drove by a lot of real estate that we own, or owned, or we have sold on terms. I pointed at it at like 65 miles an hour. Jack Butala: All kidding aside, Jill didn’t have to because I did. Earlier in my career, I mean, I know these subdivisions all over these states here, California, New Mexico, Arizona, and Nevada, I know the subs really, really well, almost by unit number. I know we’re buying some property in Modoc County right now in Cal Pines, and I’ve driven all through there. I know the units by heart and stuff. To answer the question, the topic of the show, in the beginning of your career, especially if you’re in some of the eastern states, I really think that it would be good to do that. Is it necessary? No, it’s not. Is it going to stop you from being successful? No. I’m Mr. Thorough. Jack Butala: There was no Google Earth. Jack Butala: I didn’t think of that. Jill DeWit: Don’t, they may not even been to the United States everyone, and they are doing this successfully, because they have the tools and the resources now, from what you had in ’99 are a whole different ball game. It gets better all the time. Jack Butala: We literally bought … Remember that atlas your parent’s had in the car? The 50 state atlas? Jack Butala: We literally bought that. I bought every single Rand McNally 50 state atlas and we would take pictures and photocopy it and put it in the postings. God, that’s old. I’m old. Jill DeWit: Here’s an example, Jack. In ’99 did you even have a cell phone? Jack Butala: I did, but it didn’t work. Jill DeWit: Okay, yeah you made a flip phone and it didn’t take pictures, maybe. Jack Butala: It was like a brick, you know. Jack Butala: You know what? I’m going to change my answer. Jack Butala: No, I don’t think you need to go visit to buy the land. Jack Butala: No, I’m serious. Jill DeWit: I was being your ying yang. Jack Butala: You changed my mind. That’s how I know we have a healthy relationship, too. Jill DeWit: Well, thank you. Jack Butala: You’re like [mit 00:09:31] probably the only person on this planet that can change my mind. Jill DeWit: Thank you very much. You know what? I’m going to note this as episode number 289 and I’m going to document this and I’m going to save this. Jack Butala: Get to know your best friend, do a podcast. Jack Butala: This is like the most we’ve talked to each other. Jack Butala: Like, in weeks. Jill DeWit: It’s so true. We’ve been traveling. Yeah, we popped up in town here to check on our staff and our office. I haven’t even said hello to you barely. I see you in the hall. You know? We’re like meeting after meeting after meeting. Jack Butala: You know, the other thing, too is I had for years, probably 15, 12 years, I had a full time engineer that was completely on the road. There’s 100,000 pictures that he’s taken all around the western part of the country that we used for auctions back then and we use now. It’s actually included in our stuff. There are a lot of tools … I don’t want to sound sales-y at all, but there’s a lot of resources in there to make sure that you don’t really need to go see it. There’s some legal issues with that, but I don’t want to get into it. Jill DeWit: I got an email a while ago, I don’t know if you got this one too, Jack. I got an email from someone who isolated that we had some properties in Florida, because he said, “I’m doing a group flyby, drone flyby,” seriously, so check this out. This person has isolated the people that own these properties in whatever area, so he’s going to do a drone flyover and we can all get in on it if we want to, and share the cost. It’s stuff like that that’s available. Jack Butala: Is that a member? Jill DeWit: No, it’s a random person that just … He must have pulled the data and saw that we own some property there and just sent it to everybody. That’s what I’m saying, yeah, it’s nobody that I know. They pulled that we’re an owner there. He’s doing it like, “Hey you want in? I’m taking photos of your area with my drone.” I’m like, “That’s brilliant.” That kind of stuff even Jack, 5 years ago we didn’t have that. Jill DeWit: Did I hear about … Is this really somebody that we know? Jack Butala: I have a call with him at 3:00, a deal review call. Jill DeWit: I have some questions. I think I heard it on Facebook or something silly. Jack Butala: The bear saw this drone as a threat because it had 2 cubs, and man, it stood up and, it was really cool to watch. If I just saw it on Facebook, forget about the real estate piece of it. Jill DeWit: Yeah, I’m in it for the bears. That’s what I’m saying. Who cares? Jack Butala: In California, it’s a sweet piece of property, too. He made a smoking ton of money on that. Jill DeWit: That’s cool. Awesome, very cool. Jack Butala: Join us in another episode where Jack and Jill discuss how we use information, that’s me. Jack Butala: I can’t believe you and this throne business. Jill DeWit: Am cracking up about the bear still. Oh yeah. Jack Butala: What kind of analogy was that? Jack Butala: Try to keep the bathroom humor out of the show, Jill. Jack Butala: It stops at 12? Jill DeWit: No, I don’t know. Excuse me. Jack Butala: Anybody who’s a male, let’s just say that. Jill DeWit: Exactly, they got a kick … Everybody giggled. Jack Butala: I talk about that kind of stuff with the umpire too, but out of respect for women, all over women, I don’t bring it up. Jill DeWit: You know what? All women appreciate that. Jack Butala: I sent out a funny thing today, like the stuff Jack says. I sent a posting out today and this is what today’s is, “To all French people: an attractive man smoking a cigarette is not a movie, even if it is black and white. Jill DeWit: There you go, love it. Jack Butala: Anyway, I interrupted you 3 times. What were you going to say? Jill DeWit: No, I’m good. Jack Butala: All right. Information and inspiration to buy undervalue property.